This unique one-day opportunity will provide 2018-2019 FIRST Robotics Competition (FRC) teams an off-season competition with an extremely exciting potential reward for the graduating class of 2019 FIRST students. 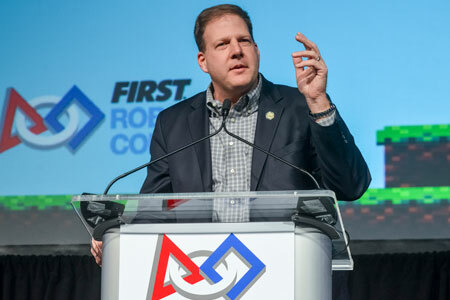 In keeping with his mission to build New Hampshire's workforce for "not just tomorrow but for five, ten, twenty years", Governor Chris Sununu has worked with the University & Community College Systems of NH to offer FREE TUITION to high school seniors on the winning alliance at The Governor's Cup. Come show your NH pride! The Governor's Cup will take place on October 13, 2018 at the ALLWell North facility at Plymouth State University. October 12 - Load-in and inspections open, detailed schedule coming soon. October 13 - 8am-6pm: Load-in and inspections continue followed by Competition. Only open to NH FRC teams. To be eligible the student must have participated for the full 2017-2018 Competition season and be participating in the 2018-2019 FIRST Robotics Competition season. Student must go through the regular admission process and be accepted by the State College or University. The free semester must be used within one year from the date of the competition.